This November, Celtic Soul, directed by Michael McNamara, will be premiering at the Bloor Cinema. 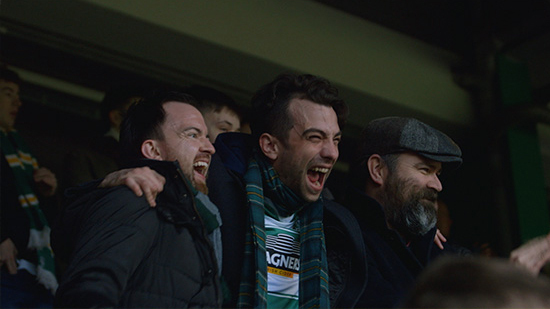 This utterly enjoyable and globe-spanning jaunt follows Canadian actor and comedian Jay Baruchel on an epic road trip through Canada, Ireland and Scotland with his new friend, well-known Irish soccer journalist Eoin O’Callaghan. It’s a story that stretches over 200 years of colourful history and that takes the duo eastward from Montreal to Westport, Ireland—where Jay’s ancestors set sail for Canada, like so many others—and finally Glasgow, where Jay will fulfill a lifelong dream: to watch a match at Celtic Park, one of the wildest and most hallowed grounds in world football. Make sure to get your tickets! On Friday, November 25 at 6:00 p.m. there will be a Q&A following the screening. The director, Jay Baruchel and Eoin O’Callaghan will be in attendance to answer all your questions!